In Ivory Coast, officials said the six suspects who were arrested had been operating a syndicate in various African and Asian countries for years. The suspects were not identified. 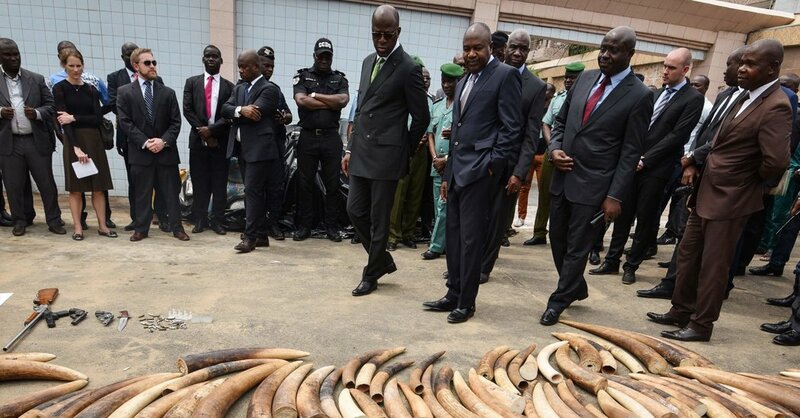 The head of the criminal organization in Ivory Coast has ties to two ivory seizures in Vietnam and Cambodia, according to the Eagle Network. Smugglers in Ivory Coast hid the ivory in hollowed logs filled with wax and resealed with glue. The logs were included in normal shipments and exported in containers to Asia, according to the Eagle Network. Authorities have discovered the same disguise method in seizures in Kenya and Mozambique. The Ivorian investigation found calls from the arrested suspects to known tax-haven countries — Switzerland, Turks and Caicos, and Saint Kitts and Nevis — prompting officials to suspect money laundering and “hints at the level of organization in the syndicate’s operations,” the Eagle Network said in a news release about the sting. The organization said the people arrested might also have been involved in human trafficking. One of the suspects was found with pages listing the identities of young Ivorian women, their photos, height and weight and whether they had been subjected to genital cutting. The Ivorian government has carried out other operations against wildlife traffickers in past months. Last year officials seized more than 200 pounds of ivory and three tons of pangolin scales, from an estimated 4,000 pangolins. Additionally they found hundreds of carved pieces of ivory, 53 elephant tails, seven leopard skins and other animal parts. China, one of the biggest markets for ivory, put into effect a ban on the sale of commercial ivory at the end of last year.